The biggest little breed in the world. 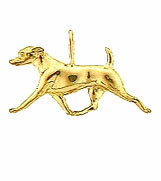 Here's your favorite canine companion in a beautiful 14kt pendant. Surely this beautiful pendant is easier to care for than your busy-bodied little friend, but both can be extremely rewarding. Show your love for this energetic and tireless breed by keeping her close to your heart on one of our beautiful lifetime gauranteed chains!